Hey, look, sometimes things aren’t going to work out the way you want them to. Sometimes you fall on your head and melt on the street. 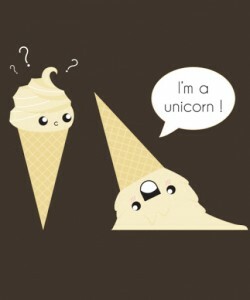 But look at it this way: at least you have your pointy side sticking up to look like a unicorn. I dunno, maybe that only applies to ice cream cones. The point is that there’s a silver lining to every cloud, and it’s your choice whether you see that or not. Wrap this piece of cloth around your torso to remind you of that. Remember: whether your vanilla, chocolate, strawberry, or any other flavor, you’re all delicious! *sigh* All this positivity is just making me hungry. Who’s up for some Steak n’ Shake?